It's time for you next alpine journey to begin with the Burton AK 2L GORE-TEX Embark Jacket - the perfect tool for getting you through the most difficult mountain weather conditions. Constructed with 2-layer GORE-TEX, this jacket seals out water and is incredibly breathable at the same time. PrimaLoft® Silver insulation provides lightweight warmth, even when wet, while the articulated fit fits just right, from the boot pack to the bar. Burton-Exclusive CSF drydye® Fabric [drydye® Black Colorway]  Burton's new waterless dyeing process saves up to 25 liters of the world's most precious resource per jacket and reduces chemical and energy consumption by half. Color is applied through a gas injection process that then liquefies the dye and recycles the clean carbon dioxide back into the system. GORE-TEX 2L  Ideal for a wide range of outdoor activities, the GORE-TEX membrane is bonded to the outer fabric only. The benefit: the separate lining inside improves wearing comfort and versatility. PrimaLoft® Silver Insulation | 60g  Originally developed for the military, PrimaLoft's extremely lightweight and low-profile core structure suspends millions of air particles in a microfiber mesh. These microscopic air particles repel water while trapping heat to keep you warmer and drier in the most demanding conditions, even after repeated washings. Living Lining™  When you're warm, breathable pores expand to release excess warmth and prevent overheating. When you're cold, breathable pores shrink to trap body heat and keep you warmer for longer. YKK® Concealed Zipper Chest Pocket  The entire [ak] outerwear line features custom-branded YKK® matte water-resistant zippers for smoother performance, better drape, a cleaner finish, increased strength, and superior protection from the elements. Fulltime Contour™ Hood with Cohaesive™ Embedded Cinch  Weather the storm with the Cohaesive™ Embedded Hood Cinch. A revolution in cord management, this bomber and ultra-streamline system integrates pull-cord hardware directly to the outerwear fabric, making hood adjustment simple and precise -- even with gloves or mittens on. Ergonomic Water-Repellent Magic Stitch Removable Waist Gaiter with Jacket-to-Pant Interface  Engineered for the movements of snowboarding, this ergonomic waist gaiter seals out snow and cold like never before, and is removable for customizing performance. The longer back creates an ergonomic fit, articulating with your body for an interface that stays locked in all day long. bluesign® Approved Product  As riders, we're all invested in ensuring healthy winters and snowfall for years to come. The bluesign® system unties the entire supply chain to reduce impact on both humans and the planet. bluesign® approved materials are guaranteed to use only safe chemicals and are manufactured to meet the highest standards of natural resource conservation, consumer and worker health, and clean air and water discharge during the manufacturing process. Fully Taped Seams with GORE-SEAM® Tape  GORE's unique seam sealant tape seals each and every seam to provide a completely waterproof and liquid resistant fabric. 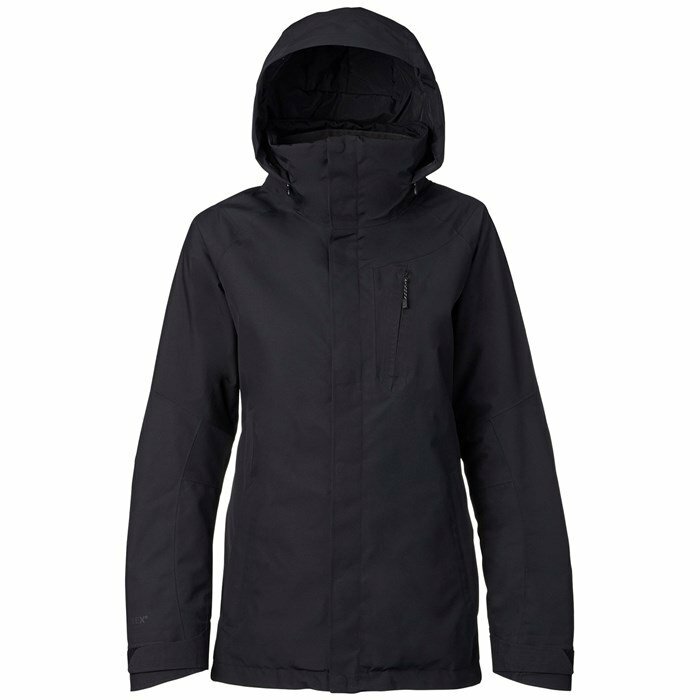 Featured on select men's and women's Burton jackets and pants.